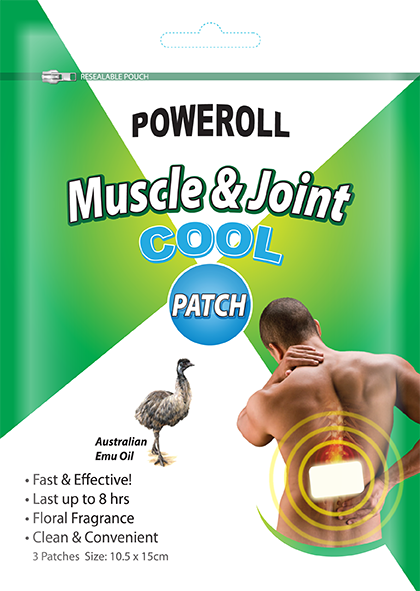 PPOWEROLL Muscle & Joint Cool Patch is a unique blend of specially formulated to relieve muscle pain. It contains Emu oil and a blend of other natural ingredients. Relief of muscular aches and pains. May assist in the management of lower back pain. Temporary relief of the pain of osteoarthritis, arthritis or rheumatoid arthritis. *Other Ingredients: Australian Emu Oil, natural Osmanthus Fragrance, Philippine Wurrus Root Extracts. Adults and children 12 years and over apply to affected area; change patch 1 to 2 times daily. Children under 12 years, consult doctor before use. How to apply: Clean and dry affected area Cut open pouch and remove patch Remove protective film and apply directly to the affected area Apply to affected area not more than 3 times daily Wash hands with soap after applying patch Reseal pouch containing unused patches. For external use only. Use only as directed. Discontinue if irritation occurs. Do not get into eyes or on mucous membranes. Do not apply to eyes, face, wounds or sensitive skin. Do not use with a heating pad or apply external heat. If pregnant or breast-feeding, ask a healthcare professional before use. Keep out of reach of children. If swallowed, get medical help or contact Poison Control Center right away. This product may cause allergic reaction in some individuals. Stop use and ask a doctor if condition worsens.Store below 25ºC and away from direct sunlight. Copyright © 2019 poweroll.com.au. All rights reserved.